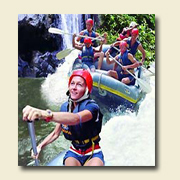 Royal Wheels India is an adventure travel group organising Ganges River Rafting Tour in India. Day 01 :Arrive at Camp Silver Sands for lunch. Check into tents, camp briefing etc. After lunch, raft a 10 km initiation section from Camp till Shivpuri. Drive back to Camp for hot tea/coffee. Campfire dinner and overnight Camp. Day 02 : Tea coffee served 7:00 onwards. After breakfast, get into rafting gear, safety briefing and raft down big volume Ganga whitewater. Raft down rapids like "Three Blind Mice", "Crossfire", "Bodysurfing", "Return to Sender", "Roller Coaster", "Golf Course" and lots more. We end the trip near Laxman Jhula. Drive 30 minutes back to Camp for hot lunch. Afternoon kayaking, volleyball or hike to a nearby village. Campfire/barbecue dinner and overnight Camp. Day 03 : Tea served by 7:00 am. After breakfast at 8:30am, drive 30 minutes to Kaudiyala. Board rafts and raft down the two big rapids on this section, the "Daniel's Dip" and "The Wall". Lots of bodysurfing and float into Camp for hot lunch. Depart for Delhi.